Join us for a hands-on, field-based day exploring weed identification, management options, and local best practices! Topics include chemical and cultural weed control, post-fire management, and a spray demonstration. Students, this if for you!! 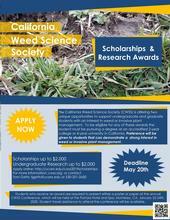 The California Weed Science Society has announced students can apply for either Scholarships or Undergraduate Research Awards, which can be valued up to $2,000. Awards will be given to students who demonstrate a strong interest in weed science, or invasive plant management. In order to apply students must be pursuing a degree at an accredited California University. Please share this announcement with all students who may be interested or eligible. You are invited to the reception on Thursday, April 4, 2019 from 4:30-7:30 PM.